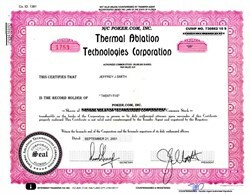 Beautiful certificate from the Thermal Ablation Technologies Corporation issued in 2001. This historic document was printed by the Caribbean Securities Ptg. and has an ornate border around it. This item has the printed signatures of the Company’s President, and Secretary, and is over 10 years old. Poker.com, Inc. was incorporated in the State of Florida on May 3, 1989 and remained inactive until June 27, 1998. The name was changed from Thermal Ablation Technologies Corporation to Poker.com, Inc. on August 10, 1999.